There are three classes of science instruments: Facility-class, Principal Investigator-class and Special Purpose Principal Investigator-class Science Instruments (FSIs, PSIs and SSIs). FSIs will be operated and maintained by the SOFIA Science Mission Operations (SMO). There will be a designated Instrument Scientist on the SMO staff for each FSI, who will support proposers wishing to use the instrument. PSIs will be developed and maintained at the Principal Investigator's (PI's) institution. The instruments will be operated by the PSI Science Team members. However, there would typically be SOFIA SMO staff designated to provide additional support. In response to proposal calls, proposals implimenting PSIs for observations may be submitted without consulting the Instrument PI or the Science Team. However, it is expected that the Instrument Science Teams would be involved in the technical review of the proposed observations, and for accepted proposals in the data acquisition, reduction and calibration. An SSI is designed for a specific type of observation, and therefore with narrower scope than either FSIs or PSIs. In response to proposal calls, proposals implimenting SSIs are allowed, but proposers are required to consult with the Instrument PI and obtain approval for the project before submitting a proposal. It is expected that the Instrument PI will work closely with proposers whose SSI proposal has been accepted. FORCAST and HAWC+ are FSIs, FIFI-LS is currently being operated in PSI mode and will transition to an FSI sometime during 2015. EXES and GREAT are PSIs. Additional information may be found on the web pages for each instrument. 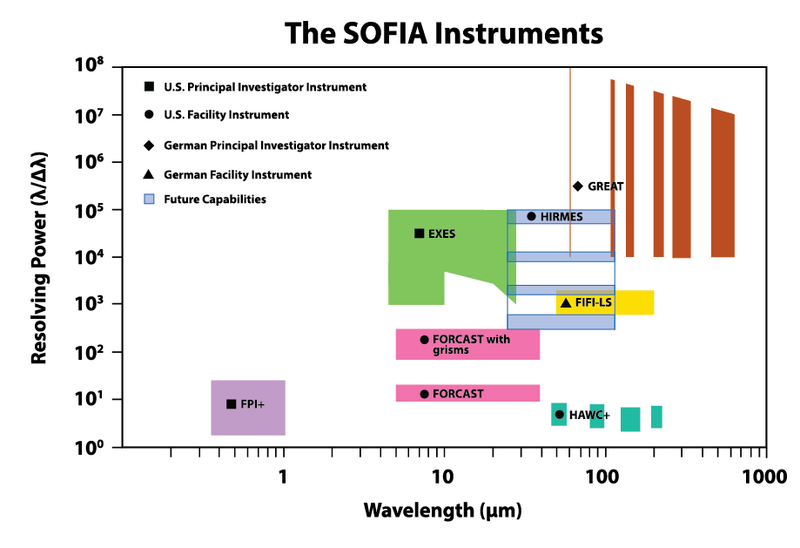 Three first-generation instruments, CASIMIR, SAFIRE, and AIRES were selected for SOFIA, but were halted at different stages of development. FLITECAM and HIPO were retired in 2018.